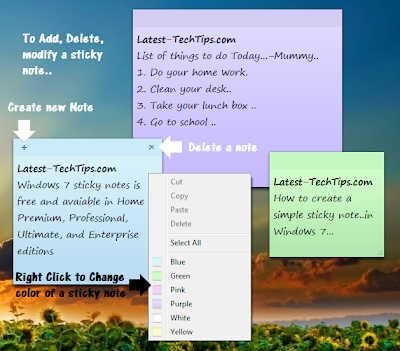 Changing the font is a pain in the sticky notes and there is no straight forward way of manipulating it but there are few easy work around which I will tell you today to have your favorite font on sticky notes and do some changes with the fonts in sticky notes. The easiest way to change a font in a sticky note is to copy the contents in the word document change the font there and paste it back in sticky notes. Once you are happy with your font in the sticky notes you can use below shot cut keys to manipulate the way the data looks in the sticky notes. 1. CTR + B : Makes selected content bold. 2. CTR + I : Makes selected content italic. 3. CTR + SHIFT + < : Reduces the font size. 4. CTR + SHIFT + > : Increases the font size. I will keep updating the list as and when I discover them.